I’m delighted to announce my “Subscribe” necklace has been selected for the European Prize for Applied Arts. 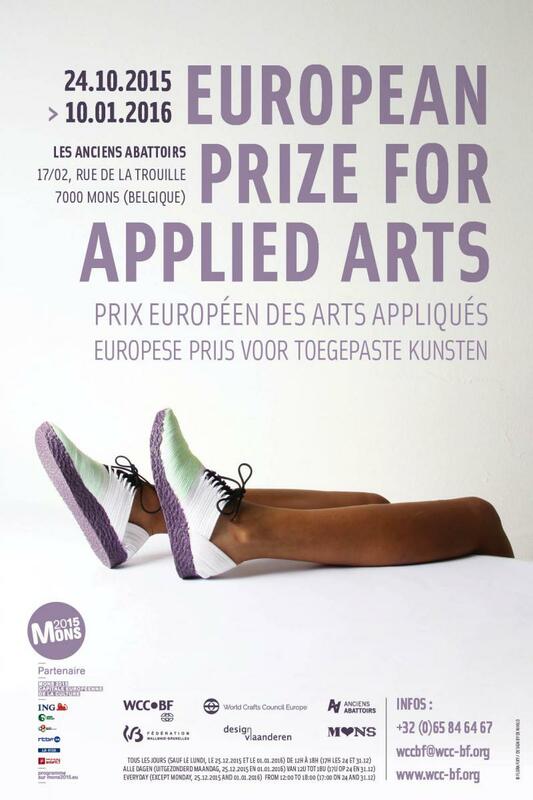 The European prize for Applied Arts showcases 78 makers from 18 countries at the Grand Hall of the “Anciens Abattoirs” in Mons, Belgium. This exhibition is part of the European Craft Summit. Beyond a simple presentation of pieces of artwork, the Triennial of Applied Arts shows us the fusion of concepts and material through the dialogue that takes place between the thought, the feelings and the hand. What are applied arts in the 21st century? What is special about these hybrid disciplines, fruit of both art and technology? Craft is inherent to the applied arts and the concepts are often used interchangeably: craft = applied art. But when you analyse both concepts – craft and applied art – more closely, it becomes clear that the one (craft) can lead to the other (applied art), and that the other (applied art) cannot exist without the one (craft). Put more simply: an applied art cannot exist that does not come from a craft, which is traditionally split up by material and how to work it, but craft and craftsmanship are much more widely usable than in just the applied arts. So where does the applied arts place themselves? The European Prize for Applied Arts tries to answer this question. Beyond a simple presentation of pieces of artwork, the Triennial of Applied Arts shows us the fusion of concepts and material through the dialogue that takes place between the thought, the feelings and the hand. This hand translates thought and tames knowledge in order to understand and translate man’s relationship with the world and with the daily things. There are no geographical boundaries for craft skills and processes. The action of making, and the outcome of a crafted object, connects cultures, communities, and generations. Handmade objects have a story. They have been touched, manipulated, hammered, thrown, blown, and carved by another human hand. They connect us both to our past, and crucially for this exhibition, they connect us to the present. But right now, while craft and DIY are so noticeably in the limelight and while social movements can be mobilized via handcrafting, unknown chances could be waiting in the wings. The European Prize for Applied Arts could play a role here, directing instead of following, and stimulating by beating new paths. The number of applications for the 2012 edition shows that the European Prize for Applied Arts has already come a long way in establishing itself as an important event for contemporary craft (or applied or decorative arts) in Europe.